We had to close the windows last night: the air stank of gas. That's right, like a chemistry lab when all the Bunsen burners are on. Or when the burner is slow to ignite on your gas cooker and some gas leaks into the air. Except that the refinery is several kilometres away across the bay. And the whole town of Milazzo was inundated with the reek of gas. People outside went home. You simply could not be outside with the chemical toxins in the air. The oil refinery, in the local newspaper the following morning, blamed the smell on an oil tanker (there is always an excuse). But: oil tanker, or oil refinery – who cares where it comes from? The issue is this: there should be NO smell in the air, no toxins released into the atmosphere, because thousands of people live nearby. Which brings us to the crux: there should be NO oil refinery in an area where thousands of people live in close proximity. I’m particularly aware of it because I have Norwegian friends visiting at the minute. Norway, as we know, has it’s own supply of oil. And where are their oil refineries? Far, far away from inhabited areas. And do they emit toxic gases? No. 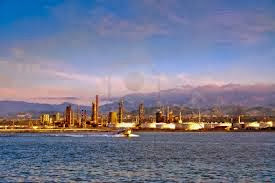 How come the oil refinery in Milazzo emits noxious gases? Because it’s in Sicily. Still not clear? The government doesn’t care about Sicily – otherwise they would never have agreed to build an oil refinery here in the first place. And on that subject, I’ve just read an interesting little address by the then mayor to his constituents: “Problemi e prospettive della nostra citta”, by Santi Recupero, in 1968. The oil refinery had been up and running less than a decade, but already its problems were manifest. Signore Recupero waxes lyrical on the wonderful economic potential that the refinery brings to Milazzo, the hundreds of jobs created and the additional economic benefit brought to the hotel and restaurant sectors who support the structure. He declares the emissions to be in line with European regulations and dismisses any possible links to lung disease, or cancer. Well, now we know better.